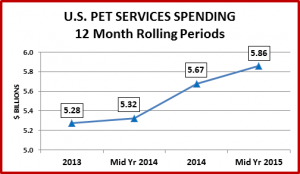 The spending on Total Pet Services in the U.S. is $20.85B. This is down -$1.15B (-5.2%) from a year ago. These figures are based upon data published in the USBLS Mid-year Update of their Consumer Expenditure Survey. As we saw in the Pet Products update, the story is complex. We will take a closer look at each of the two Service Segments – Veterinary and Pet (Non-Veterinary). Let’s start with the good news. Flat…then trending up. This chart gives a good overview. Let’s do some direct comparisons of like time periods. We have seen extreme price sensitivity in the Supply segment but thus far Services have been relatively immune. However, it should be noted that the CPI in Jan>Jun 2014 was up over 3.2% from 2013 and sales flattened out. The CPI increase from July 2014 through June 2015 dropped below 2.5% and sales increased. Perhaps 2.5% is the limit? There is no clear pattern here. The “Boomers” and the “Millennials are contributing to the growth. The younger Gen X group shows the only decline. The number of 35>44 year old households was essentially equal. 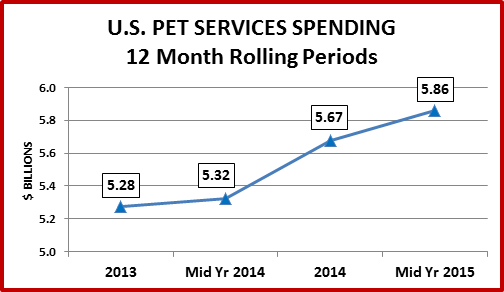 Their annual H/H spending on Pet services fell 3.6%…but only $1.80 per H/H. Let’s look at Income. With the $30>$70K group showing the only decrease, and the under $30K showing an increase, it appears that income is a factor, but it’s not “clear cut”. Time to pull out the “master database” and look deeper. Driving the increase, we find the “usual suspects” – college educated, managers or professionals, who live in an “urban” setting, own their own home (with a mortgage) and make over $100K per year. We also need to include the over 65 crew, who make less money but have an increased need for pet services. Now let’s look at who makes $30>$70K. On the decrease side we find a whole group of occupations – technical & clerical workers, operators & laborers, construction workers & mechanics. The drop is actually by far the greatest in households of 2 or more people with one earner (-0.34B). It’s also focused on incomes ranging from $50K>$80K, not the low end. There is not a hypersensitivity to price but these groups are definitely watching their budgets. 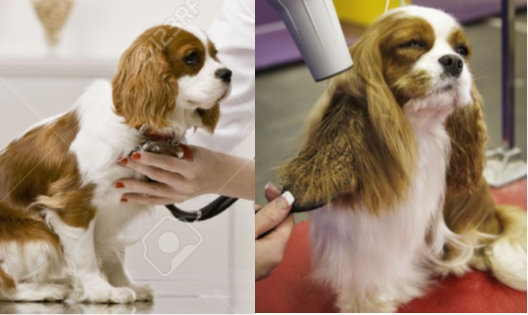 Pet Service Spending can be a convenience or as in the case of aging Pet Parents, a growing need. The bulk of the spending in this segment is discretionary. Therefore Income is a big factor. In fact 34.9% of the H/H’s, those over $70K in income, account for 68.1% of the spending. 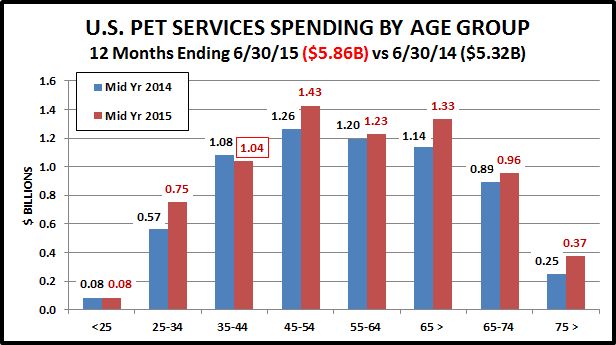 Moreover, the over $120K income group, 14.4% of H/H’s spend 37.4% of Total Pet Services $. NOW ON TO THE VETERINARY SEGMENT! Veterinary Spending turned sharply downward in the first half of 2015, after a huge increase in 2014. This chart should help put these trends into perspective. A rapid climb that slowed, then a steep drop. Let’s compare like time periods. 2014 vs 2013: Sales up $3.03B (+20.8%) Incredible! It is apparent that the mid-year spending decrease was widespread across U.S. H/H’s. 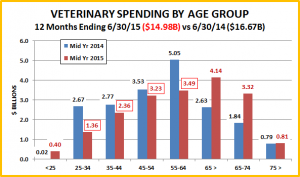 Every age group from 25 to 64 spent less – a Total of -$3.58B. This group includes over 90M H/H’s, 70.6% of the U.S. total. The over 65 group had a substantial increase, $1.51B, with more than half, $0.8B coming from Retirees. There is also good news from under 25 group. Their spending was up $0.38B. Remember, they had a 30% increase in Food spending. These numbers indicate that more in this group are becoming pet parents. The drop is evident in every income level over $30K…even the $120K> group. This includes 86M H/H’s – 67.2% of the U.S. total. The < $30K group is surprisingly showing an increase of $0.83B. This is primarily driven by Retirees and the under 25 age group, who together had a $1.1B increase. 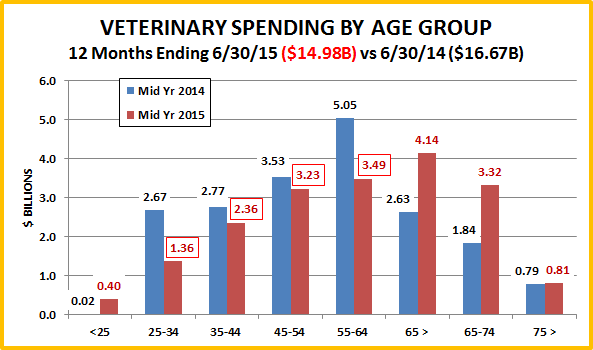 We generally consider most Veterinary expenditures as “need” rather than discretionary spending. Regular Veterinary care for their companion animals is a responsibility of Pet Parents. However, non-emergency services may be becoming more discretionary to the consumer. The extraordinarily increases in Veterinary prices over a number of years has caused many of the lower income groups to delay or even forgo services. This was evident in 2014 when an overall $3B increase included a $1B drop from H/H’s with income less than $50K. It appears that we have 2 opposite trends in the overall Services group. 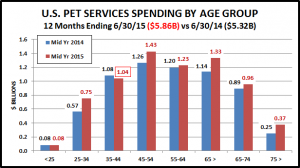 Pet Services spending, which has generally been considered discretionary and very dependent on income, is showing increased spending based upon “need” with the aging of the huge group of Baby Boomer Pet parents. 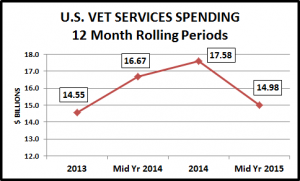 Veterinary Services, at least the non-emergency portion, which has been considered “need” spending is moving to a more discretionary nature due to years of extraordinarily high inflation and the increasing price consciousness of U.S. consumers.